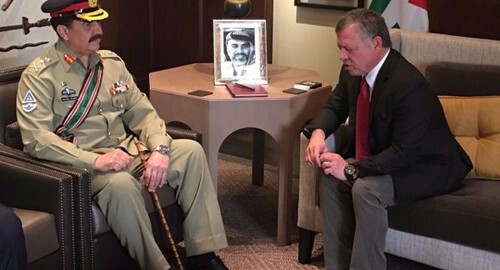 RAWALPINDI (92 News) – COAS General Raheel Sharif called on His Majesty King Abdullah during his tour to Jordan on Tuesday. According to the ISPR, they discussed matters of mutual interest, enhanced defence and security collaboration and regional security. King Abdullah appreciated Pak Army’s achievements in fight against terrorism and efforts to promote regional peace& and stability. 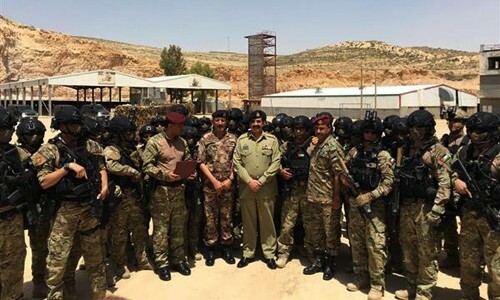 Earlier, Chief of Army Staff General Raheel Sharif witnessed field exercise of Jordanian Special Operations Forces at King Abdullah Special Operations Training Center. General Raheel Sharif appreciated the state-of-the-art training facility and exchanged views with the exercise participants. The COAS vowed to share and benefit from each other’s experience in counter-terrorism operations.